For whatever reason, Melissa McCarthy appears to be a Marmite actress with most people. Some tend to adore her crass, unconventional and, most of all, funny nature best demonstrated in The Heat and her Oscar-nominated turn in Bridesmaids; while others simply find her too crass and overbearing to even raise a smile, most notably so with her small role in The Hangover Part 3 and especially in last year’s failed star vehicle Tammy. No matter what, though, people are sure to have more of a firm opinion of her after seeing Spy, her third consecutive film with director Paul Feig – and thankfully, it is destined to be more positive than you think. McCarthy is truly delightful in a more different type of role than we’re used to, as desk-bound CIA analyst Susan Cooper whose job of helping suave super-agent Bradley Fine (Jude Law) navigate dangerous missions is made harder for her due to her unreciprocated feelings for him as well as a sense of underachievement. When Fine is taken out by aristocratic arms dealer Rayna Boyanov (Rose Byrne) who also knows the identities of the CIA’s top agents, thereby rendering them useless, Susan volunteers to go into the field and take action. From there, all sorts of shenanigans both comedic and surprisingly brutal ensue. In the hands of a lesser filmmaker and lead star, it would be a basic comedy of how out of her league this non-spy is, and how they must dig themselves out of the hole they have dug. On the contrary; Susan is shown to be a person who truly knows her stuff when it comes to operative measures, and she proves to be a shockingly competent field player with an intelligence and dedication to her craft. This is no mere comedy foil, but a strong and capable person who just so happens to be in a more physical role than she’s used to. McCarthy is able to give her a firm but sympathetic personality, and when she does resort to the crass and authoritative tone for which most audiences know her it’s for a clear reason and not just because she can. This is definitely a person worth rooting for, and McCarthy makes the role more than her own. Thankfully, the rest of the film is just as entertaining as its lead. Though it does start off fairly dry in the humour department (bar one hilarious shock moment unfortunately spoiled by the promotional material), the film proceeds to get funnier and funnier all the way to the end, scoring big laughs in many places from the barrage of insults hurled toward Susan’s frumpy disguises – “I look like someone’s homophobic aunt”, she complains – to probably the funniest entry of a Jason Statham character ever put to film (intentionally, of course) during the climax. Statham, incidentally, is a riot here as a deadpan rogue agent infuriated by Susan’s appointment to the field, happily sending up his tough-man Expendables images for some very unexpected hilarity; threatening to steal his comedic thunder are Miranda Hart, as Susan’s excitable pal eventually brought along for the ride, and Peter Serafinowicz as an Italian agent who’s more than excitable for our lead heroine. Throw in some well-done action sequences and fight choreography, and you get something that would make a fine double-bill with Kingsman: The Secret Service. We’d say that there are a few things that don’t wholly work, for example Bobby Cannavale’s main bad guy (outside of Byrne’s snooty socialite) isn’t as funny as everyone else, and there is a twist late in the second act that most people will probably see coming a mile off, but overall it doesn’t damage the enjoyable nature of the film. If you’re going in wanting to see a highly entertaining spy comedy, then you’ll certainly be satisfied but just know that it does take a while for the humour to settle in. Once it does, Spy is an immense amount of fun, and proof that the pairing of Feig and McCarthy is – so far, anyway – dynamite in the sorely lacking field of genuinely funny female-centric comedies. To all those out there who are already dismissing their next collaboration, the highly-publicised female reboot of Ghostbusters, who’s laughing now? 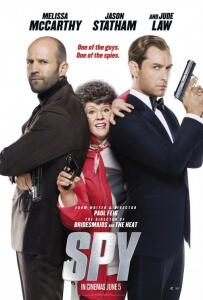 Spy is a highly entertaining and very funny spy comedy that works wonderfully as a showcase for the lovable Melissa McCarthy in all the ways that Tammy didn’t, complete with well-made action sequences by writer-director Paul Feig and a scene-stealing comedic turn by a self-parodying Jason Statham.